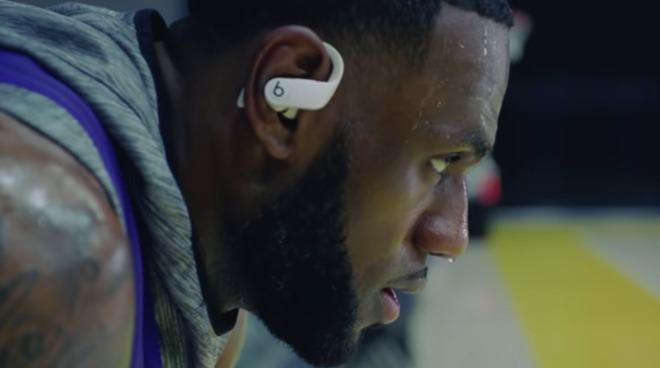 Apple is promoting the Beats Powerbeats Pro with a new commercial on YouTube, using an array of celebrity athletes to show how the wireless earphones can be used without fear of being lost while working out or performing intensive activities. Launched on April 3, the Powerbeats Pro are $ 249 wireless earphones under the Beats brand that offer practically everything that Apple’s AirPods provide, but in a more fitness-friendly packaging. In its latest YouTube video for the Beats by Dre channel, Apple takes time to highlight just how suited to activity the audio accessories really are, due to how they hook around the ear. Accompanied by Beck’s “Saw Lightning,” the minute-long video features a number of famous sports stars and athletes wearing Powerbeats Pro while working out. The video starts off with gymnastics, before moving through other sports including skateboarding, soccer, rock climbing, sprinting, and boxing, with the earphones staying in the center of the frame throughout most of the high-speed action. The list of stars, as spelled out by Beats, and in order of appearance includes Simone Biles, Antony Joshua, Serena Williams, Lebron James, Eden Hazard, Owen Farrell, Ramla Ali, Zoe Smith, Ben Simmons, Odell Beckham Jr., Kevin Rolland, Leticia Bufoni, Miho Nonaka, Shaun White, Alex Morgan, Ruddy Trobillant, and Jasmine Perry. Using the same H1 chip used in the AirPods, the Powerbeats Pro are claimed to offer superior cross-body Bluetooth connectivity and support for “Hey Siri” vocal prompts. Wearers can enjoy up to nine hours of usage per earbud, with more than 24 hours of combined playback using the built-in battery of the magnetic closure case, and a “Fast Fuel” facility can allow up to an hour and a half of charge to be accumulated in the earbuds after just five minutes of charging. . Beats will be shipping Powerbeats Pro in the United States and 20 other countries in May for $ 249.95 in a choice of Black, Ivory, Moss, and Navy color options.